By taking a ground-up approach we were able to succeed in making a throttle body that performs better than OE while retaining OE fitment and daily drivability. With easy installation and drop in fitment, you are sure to enjoy the gains from the CorkSport Throttle Body. Check out the video and installation instructions below for more info. Instead of trying to enlarge an OE throttle body or adapting to a different vehicle’s throttle body to work, we started this project from the ground up. This gave us complete design freedom to make the best throttle body possible. The CorkSport Throttle Body uses 100% brand new parts. The body is an aluminum investment casting that was made precisely to our CAD optimized specifications. 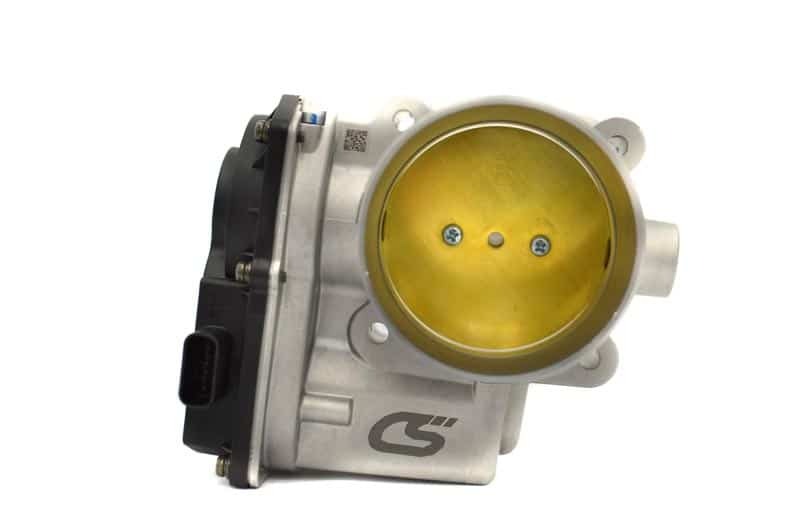 Coupled with new electronics that are based on the OE logic, the CS throttle body is truly a full OE replacement. 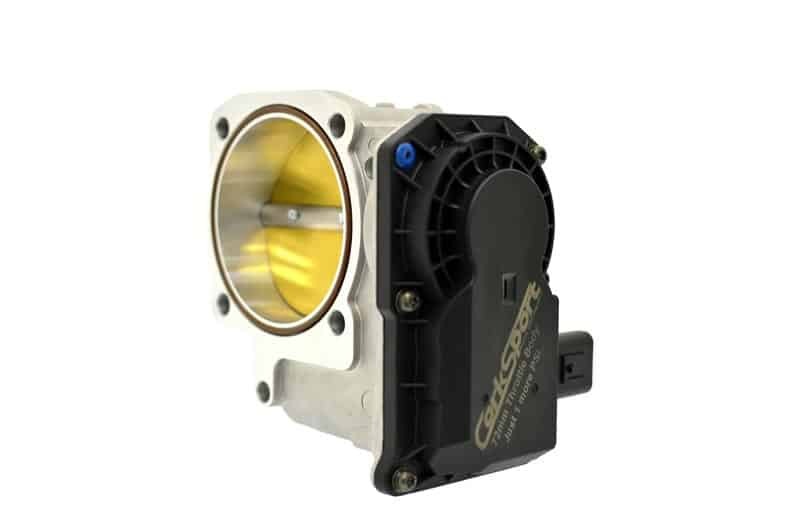 The CorkSport Throttle Body increases the throttle plate diameter from 60mm to 72mm to allow for the maximum flow that can be achieved with the OE bolt pattern. This may not sound like a very large increase, but the stock throttle body opening fits inside the CS Throttle Body opening with plenty of room! To further help with flow, the face of the throttle plate is flat. By using a D-shaped center pivot, the airflow does not have to go around a bump right in the center of the throttle plate. Plus, this design has been endurance tested to ensure that it will stand up to the test of time. By sticking to 72mm, the OE bolt pattern could be retained. That means the install stays simple and does away with any need for special adapter plates or a different intake manifold. It has been test-fitted and proven to work on OE, CorkSport, and JMF intake manifolds. 72mm is also the optimum size for versatility between 2.5"; and 3"; intercooler piping so it will fit almost any TMIC or FMIC setup. As a final touch, an O-ring groove is machined into the body with an included O-ring so you do not need to re-use the OE gasket (it's too small for the 72mm opening anyway). Don't worry though; the O-ring is safe with oil, gas, methanol, ethanol, and other chemicals that may find a home in your engine. 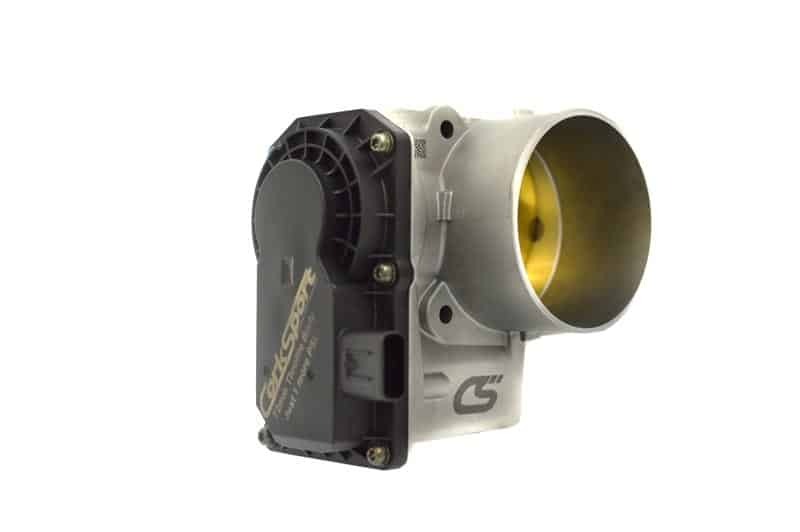 We have extensively tested the CorkSport Throttle Body and have found that it flows about 150CFM more than OE when the throttle body is 75% open (which is 100% accelerator). 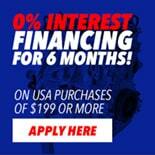 This is about a 33% increase over the stock throttle body. That is all well and good but what does it mean? In daily driving, we noticed better response with no CEL or choppiness. When testing for power on a midsize turbo (GT30 size), we primarily noticed that the turbo was spooling at a lower RPM. When we moved to a big turbo (GT35R or larger) we saw 100-200RPM lower spooling and an increase in midrange power. Checkout the dyno graph to see for yourself, blue is the CS throttle body, green is the OE throttle body. Note: there were no changes other than adding the CorkSport Throttle Body. 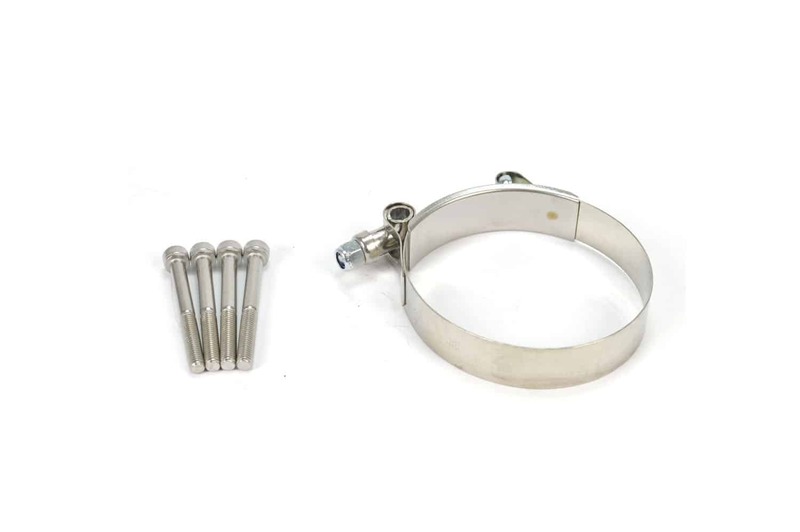 3"; straight and 3” to 2.5” straight couplers for front mount intercooler setups. 3"; to 2.75” elbow for Mazdaspeed 3 and Mazda CX-7 top mount intercooler setups. 3"; to 2.75"; straight coupler for Mazdaspeed 6 top mount intercooler setups. The CorkSport Throttle Body does not retain the OE throttle body coolant ports. This does not cause any adverse effects; however, the coolant lines will need to be rerouted upon installation. The CorkSport Throttle Body has not been test-fitted with every single aftermarket intake manifold and intercooler piping option on the market. Fitment may vary. The CorkSport Throttle Body has been test-fitted with ONLY the CorkSport throttle body spacer. Fitment may vary with other throttle body spacers. The CorkSport Throttle Body can be installed with no tuning, however, to ensure optimum performance and engine health, a tune after installation is recommended. It will take you one hour to install the CorkSport Mazdaspeed Throttle Body with our easy-to-use instructions. Such a beauty to get this in the mail! Super easy install and much more response on the low end! Well worth the money for anyone trying to get the most out of their car! Bought this product and between adding different modifications i switch back and forth to the stock throttlebody and the Corksport throttlebody to gather data. The ground up design of the 72mm throttlebody on the stock intake manifold works well enough as city driving it feels stock and no choke for fuel or air in any RPM. Car will idle a bit higher at a cold start and you may experience some idle fluctuations at idle at a stop light or coating in neutral as a proper tune is recommended BUT highway driving pulls are smoothe and RPM's build nicely. The stock manifold throttlebody port size is a bit smaller than the Corksport throttlebody so to fix that you can port match your intake manifold to the Corksport throttlebody or buy the Corksport intake manifold that comes port matched to their throttlebody but directly bolting it on to your stock intake manifold has no negative impact that I have yet to experience. 72mm Throttle Body is CRAZY and I Love IT! Stomp the gas and it planted me back into my seat, torque steer, and spin the tires! It’s a must buy! I wish they came out with this sooner! Section 3 in the instructions makes no sense. What am I supposed to do, disconnect the hose and then reconnect the same hose? The coolant hose feed will be disconnected and then plugged back into the return to that it bypasses the throttle body.